Counterfly is sticking to a seemingly slow but steady release routine of one EP per year, including the occasional exception from the rule. After “Glazed” (2016) and “The Invisible Journey” (2017), we are proud to introduce the third release of our Italian buddy Lorenzo on Broque, who, from his Berlin exile, has created six fairly special new tracks. “Retroversion” is continuing the eclectic approach of the previous EPs, which always managed to bridge styles and sounds which otherwise would hardly appear in the same track. 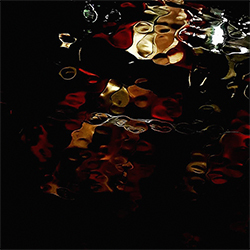 But, different to his prior releases, the warm and jazzy sounds have shifted into the background and only make occasional appearances, giving way to a darker and more industrial vibe. If one may want to use some old-fashioned stereotype, you could say that, after several years, the roughness of Berlin has finally won the upper hand over the sunny Italian homeland. In fact, the massive and distorted echo spaces of tracks like “Beaten Path” remind of Scuba’s long lost SUB:STANCE nights at Berghain, bridging between dub(step), techno and industrial. Surely, Lorenzo’s roots emerge occasionally, for instance, in the form of piano chords in “Back To Logic” or through playful electronica melodies in “Retroversion”, but it’s fair to say that this is not only Counterfly’s darkest but also his most mature release.